Matching tractors and implements of appropriate size is a major management decision facing many farmers and ranchers. Proper sizing will minimize time and labor requirements while maintaining efficient field operations. If the tractor is oversized for the implement, fuel consumption and costs will be higher than necessary for the work done. According to data from Lazarus, a 200 HP MFWD tractor costs $24.27 more per hour of use than a 130 HP MFWD tractor; costs include fuel and oil, maintenance and repair, depreciation and overhead, which includes interest, insurance, and housing. If the implements are too large for the tractor, overloading will occur, resulting in slow field speeds and, therefore, reduced field capacity and quality of work. Overloading also causes excessive wear, increasing downtime and maintenance costs. Farmers can evaluate how different equipment sizes affect the time needed to accomplish tasks by examining work performed in acres per hour (Lazarus). Table 1 below compares plowing 300 acres with a 15-foot chisel plow to a 21.3-foot chisel plow with front disks and a fold, and a 57-foot chisel plow. 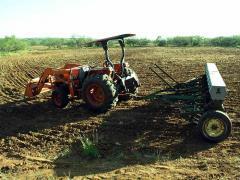 Total cost per acre for plowing 300 acres vary by a maximum of $1,566 depending on which piece of equipment is used. The difference in time required to plow is as high as 26 hours more. The larger equipment uses more diesel per acre; it costs $1,221 more to plow 300 acres with the largest equipment in this example. Farmers will need to examine the tradeoffs between time, costs, and fuel used. Data and calculations in Table 1 were based on information in Machine Cost Estimates by William F. Lazarus, University of Minnesota for May 2011. Costs for buying new equipment also vary by as much as $215,000 (see Table 2 below). Farmers should also examine these initial costs. Data in Table 2 were based on information in Machine Cost Estimates by William F. Lazarus, University of Minnesota for May 2011. Selecting an implement to match the tractor depends primarily on tractor size, soil type and condition, field speed, and implement pull requirements. One of the most common errors in equipment selection is to overestimate the drawbar horsepower produced by the tractor. Normally, only 50% to 65% of the maximum PTO horsepower is converted to drawbar horsepower in the field. Consequently, many implements are oversized for the tractor. Performance data on every tractor sold in the United States can be found at the Nebraska Tractor Test Laboratory Tractor Test Reports. In general, if implements are matched to tractor size, a tractor should be able to pull the implement in the 3 to 8 mile per hour range. When a tractor can easily pull an implement faster than about 8 MPH, the tractor is probably too large for the implement. Conversely, if the tractor cannot pull the implement faster than 3 MPH, the tractor is probably too small for the implement. Surveys in the past have shown several operations such as spraying, harrowing, and cultivating consume more fuel than would be suggested by mathematical calculations. Analysis of that survey data often revealed that too large a tractor was used for the particular field operation. When properly loaded, larger tractors can be more efficient than smaller tractors, yet using small tractors to pull small implements or to do small jobs can be more economical and fuel efficient than using large tractors to pull small implements. 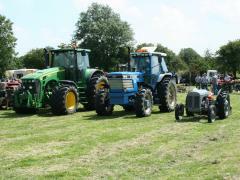 Farmers should consider keeping small tractors that are in good condition for doing the smaller jobs around the farm. 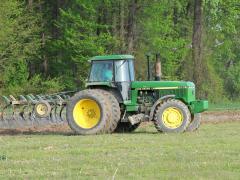 An alternative to using a smaller tractor is to employ the concept of “gear up—throttle back” with a tractor that is too large for an implement. When pulling light loads for short periods of time, a fuel savings can result from pulling that load in a higher gear while reducing RPMs; the RPMs should stay higher than 20% to 30% of the rated RPM. The appearance of black smoke during the operation may indicate overloading and would suggest going to the next lowest gear.